Pre Entries have now closed for the Race on Sunday (7th April) Entries on the day are available from Registration on Saturday afternoon and Sunday morning. They are £35.00 per person and are payable by cash only. Firecrest Mountain Biking is working in Partnership with the Forestry Commission and Aston Hill Bike Park to run Downhill Races on Aston Hill in 2019. 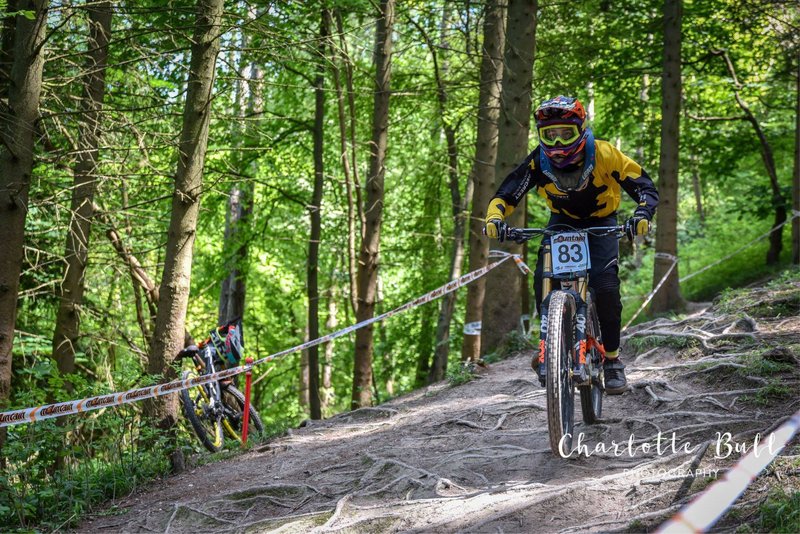 Ricochet is one of the faster, flowing Downhill Trails on Aston Hill a riders favorite and a great track for first time racers to give downhill racing a go! All racers will complete at least 1 Practice Run and get 2 Race Runs with the fastest time counting for their final category position. Aston Hill is open as normal and all riders must follow the local rules and fees. The Race Course will be marked out on Saturday. Saturday is not part of the Event. There are no Race Marshals or Medics on the track. Registration – You can collect your Race Number Board on Saturday afternoon to save time on Sunday morning. Please Note: You are responsible for your own safety and wellbeing on Saturday. You must sign on and collect your number board before 10am on Sunday. All riders must sign on and collect their number boards before Race Practice on Sunday. Please Note: Full Face Helmets must be worn and done up for Practice and the Race. Race Practice and the Race Marshals will be positioned along the Course for your safety. They will have red and yellow flags, radio communications and be briefed the morning of the race. 8.45am – 10.45am – Race Practice all riders must complete a minimum of 1 full run in Practice. Race Categories – No license is required to race. Categories in Mountain Bike Racing are age and ability based. Ripper Age 10-12 – Riders in the years of their 10th, 11th and 12th birthday. Juvenile Age 13-14 – Riders in the years of their 13th or 14th birthday. Youth – Age 15-16 – Riders in the years of their 15th or 16th birthdays. Junior – Age 17-18 – Riders in the years of their 17th and 18th birthdays. Senior – Age 19-29 – Riders in the years of their 19th to 29th birthdays. Master – Age 30-39 – Riders in the years of their 30th to 39th birthdays. Veteran – Age 40+ – Riders in the years of their 40th birthday onwards. Expert/Elite – Open to Expert and Elite Competitors only. Medical: Paramedic Medical Cover will be provided, on the Race Course and from an identifiable Base Station in the Event Arena. Body Armour – We recommend that all riders, especially Juvenile and Youth age riders, wear body armour giving protection to the spine, elbows and knees. Behaviour – For Anti-social behaviour, vandalism, riding mini-bikes, motorbikes, driving recklessly at the Event a rider will be disqualified and asked to leave the Event. Acts of violence, intimidation or vandalism will receive a lifetime ban. Under suspicion of theft, the police will be called and you will be detained until their arrival. Dogs – All dogs are to be kept on a lead at all times. Please consider the safety of those competing and spectating before bringing your dog to the Event. Results will be posted at the Registration/Sign On Desk on completion of each Race Run and online by 12:00pm on the Monday after the event at the latest. Illegal Drugs Policy: We run a zero tolerance policy on illegal drugs. If we suspect you are in possession of using illegal drugs, we will ask you to leave the venue and the Police may be called. Camping: No Camping will be available onsite. Event Updates: A Notice Board will also be on display at the Registration Desk for displaying updates and information regarding the Event. Catering: There will be a caterer onsite providing fresh hot and cold food and refreshments. Trade Stands: There will be Trade Stands at the Events selling a range of spares and accessories. Details will be posted on the Firecrest Mountain Biking Website and on Social Media. Refund Request: 29+ Days Notice: Entry fee minus a £10.00 administration charge per race cancelled. Refunds will be credited back to the payee and the account from which you originally paid within 28 days of your notice in writing. Please Note: You cannot not swap your entry with another rider. Definition: The ‘Race Weekend’ starts from 15:00hrs on the Friday before the race. Therefore the timescales above mean all e-mails must be received by 15:00hrs on Friday 11th May 2018. Please note we will not deal with any cancellations over the phone, by text or social media. Please inform us of your full name, and category. Force Majeure: If Firecrest Mountain Biking is prevented (directly or indirectly) from performing any of its obligations under the ‘Entry Agreement’ by reasons of act of God, Strikes, Trade Disputes, Breakdowns, Government or Political Action, interruption of Transport, Acts of War or Terrorism, Acts of Omissions by a Third Party or for any other reasons whatsoever outside of Firecrest Mountain Biking’s control, then Firecrest Mountain Biking will be under no liability whatsoever to you and may as its option, cancel the Event. If the Event is cancelled Firecrest Mountain Biking will not be liable for costs of travel fares, hotels, or any other expenses that may be incurred. It is your responsibility to ensure the Event is going ahead before travelling. We will do our best to inform you if the Event has to be cancelled but we do not accept liability if we are unable to contact you. We strongly advise that you check before making travel and accommodation arrangements. Please follow Firecrest Mountain Biking on Facebook, Twitter and Instagram to ensure you are kept up to date.